In December 2004 the club left the British Kempo Ryu Union and became independent. 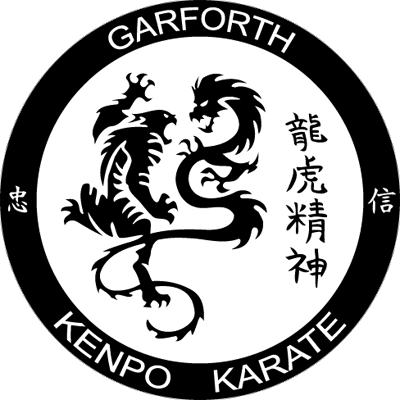 In accordance with this the name of the club was altered from ‘Garforth Kempo Ryu Karate’ to simply ‘Garforth Kenpo Karate’. The club name is now spelt as Kenpo rather than Kempo to indicate that the club is descended from the lineage of Senior Grand Master Ed Parker, and that the style we study is American Kenpo. The Tiger and the Dragon appear on our club crest just as they appeared on the original American Kenpo crest. The Tiger and the Dragon in this context represent psychological states of mind rather than styles of fighting; so we are referring to ways of thinking rather than ‘dragon style’ or ‘tiger style’ kung fu for example. Though the meaning behind these animals is fairly philosophical it is still very much relevant to keeping yourself safe on the streets today. The Tiger represents the student at the beginning of their journey. His strength rests in his physical power and and he is eager to fight and demonstrate his skills. He represents action rather than reaction. Though the Tiger is strong and able he does not possess the wisdom and humility which come with time. The Dragon represents the more seasoned and enlightened student. He does not represent the student who has completed their journey since the journey is life long—there is always more to learn. Though the Dragon is physically strong he relies more on his mind to protect himself. The strength of the Dragon therefore comes from within himself. The Dragon represents reaction rather than action, meaning that he will not initiate conflict and will always avoid conflict where possible. The Dragon hides his knowledge so that if he does have to fight his opponents will be taken by surprise when his force is unleashed without forewarning. To become as the Dragon is the ultimate goal for the Kenpo student. That is to say that the experienced Kenpo student is confident of their own abilities yet is not eager to show them. Their mind is always active when in a potentially dangerous situation (situational awareness) and they should always be aware of danger, wherever possible, before it is aware of them. These students are both humble and committed. Remember though that as our attitudes change to become more like the Dragon, we still retain the Tiger within ourselves. His power and fury is always there ready to be used if there are no other options. Remember also that the Dragon knows his own strength while the Tiger does not. Firstly know when what you have is not adequate, and secondly know how to use only that force which is necessary. The kanji (the name given to most common form of Japanese script) in the centre of the crest reads 'Tatsu Tora Seishin'. The first character is ‘tatsu’ and means ‘dragon’ and the second character is ‘tora’ and means ‘tiger’. The third character is ‘sei’ and the fourth character is ‘shin’, together creating the word ‘seishin’. This is often translated into English as ‘spirit’ but this is a fairly poor translation. Seishin to the Japanese conveys more a sense of the very essence of being. This text then reads “Spirit/Essence of the Tiger and the Dragon”, and conveys exactly the same meaning as the images of the Tiger and the Dragon as explained above. The calligraphy for this section of the crest was created by an artist named Bruce Rimell. The kanji in the left hand side of the border is ‘chu’ and the one in the right hand side of the border is ‘shin’, together creating the word ‘chushin’. Chushin translates as loyalty and trust and here it represents the reciprocal loyalty that is expected between ourselves and our students. I felt compelled to include this into the design of the new logo when the club left the old association, to show that our students can trust and rely on us. Loyalty is one of the ‘Seven Virtues of Budo’ by which lived the Samurai, along with rectitude, valour, benevolence, respect, honesty and honour.